The Arbuckle Family Blog: When will "home" change? I have not lived in my home town since 1998, when I went away to college at FSU - GO NOLES!! That was eleven years ago.. boy am I old. I am now married and have an amazing husband and beautiful daughter. We have a wonderful "home" and life in North Carolina, but for some reason, I still consider FL my home. When people ask me where I am from, I say FL. I really noticed it on this trip. We went to Disney and they always ask you where you are from. Justin would say NC and I would say FL. I have been contemplating why I still consider FL my home and obviously I am NOT a deep thinker... so I am still contemplating. There was a scene in that movie where the guy's family surprised them with a party when they arrived. Justin turned and said to me, "That reminds me of your family". My family is the type that will throw a party for any occasion. They are fun, loud and sometimes crazy!! 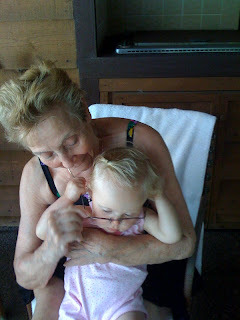 Kate with my grandma (mom's mom). We went swimming at her house. I have so many fun memories swimming in her pool. This was the only picture I took.. we were busy swimming. Kate was trying on Grandma's glasses. As you will see.. trying on glasses became a recurring theme.. I hope this is not a picture of what she is to become.. she looks like an old librarian. I promise, she is a cute little girl. She is deep in thought.. or straining to see through the lenses... YES, I know this is bad for her eyes, but I just left them on long enough to snap a picture. Does that make me a terrible mom? Kate with my grandpa - Pap-Pap (dad's dad). Kate loves Pap-pap and would not stop saying his name. Every morning she would wake up and say, "Pap-pap" and look for him. We had a birthday party for my cousin, Ryan.. who I thought I took a picture of, but I didn't. Kate is here at his party with my aunt Kim. Kim is one of the best cooks I know.. and made my favorite... her baked beans. Maybe I can talk her into giving me the recipe for my blog!! Here are some of my cousins with Kate. Ronnie and Katie picked out this cute little float for her to use in the pool. She also liked playing in it out of the pool. Kate with my dad, her Papa. His name is also one of her favorite words. She knows who to kiss up to!! He spoiled her like crazy on this trip. This is Kate with my cousin, Ronnie, who bought this adorable outfit she is wearing from Baby Gap. He picked it out himself. It was so sweet of him.. and this outfit is one of my favorites! Me and Kate with my cousins.. yes, I am old compared to them. I wish my cousin Brad was there for the picture.. he would have helped me round out the age. My uncle Jay, aunt Deb, and cousins Katie, Kevin and Chris. This was a lowlight on our trip... My cousin Katie (pictured below) decided to give Kate a golf ball to hold. Kate decided to SLAM the golf ball into Katie's head. As you can see below from the large bump between Katie's eyebrows. I felt so bad!! Katie was leaving to go on a trip the next day, and I know that she didn't want to look like a unicorn. I was so afraid that the bump was going to grow into a horn-like fixture and turn black. Thank goodness, it didn't. I saw her the next day and it was fine and you could barely see it. Yes, we need to teach Kate not to hit people with golf balls, but we probably didn't do a very good job after this incident because we were all laughing hysterically at the bump on Katie's face... and the nice cousin that I am.. I had to take a picture for my blog! funny... cause I still think of NC as home. I think of home as wherever you have the best memories. My philosophy with flying is "I will never see these people again". One thing that helps us is no matter what we carry Anna's car seat on and never let her get out cause she would be climbing everywhere. I guess you can do that when she turns 2!